Back to 1967 Lighthouses. Forward to 1981 Lighthouses. 1969 was the centenary of the founding of the Government Life Insurance Office and a new series of stamps was issued to mark this occasion. 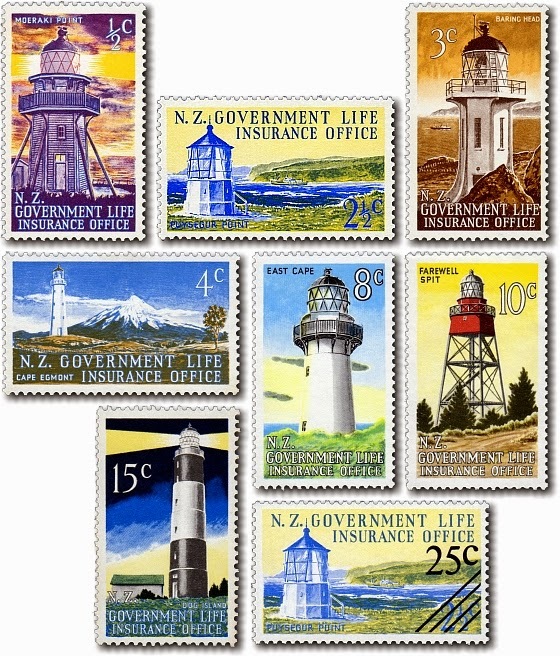 Lighthouses, the symbol of the New Zealand Government Life Insurance Department, was again the subjects depicted on the stamps. You will be able to find all of these lighthouses on the map further down this page. Due to changes in postal demands, in 1976 the 8c and 10c were added to the set. Two years later, in 1978, the 2½c was overprinted with 25c. ½c - Moeraki Point Lighthouse. Moeraki Lighthouse can be found near is a small fishing and holiday village of the same name on the Otago coast of the South Island. The location is famous for many large round boulders that can be found on the nearby beaches. Moeraki is a Maori name meaning "drowsy day. First lite, on 22 April 1878, the wooden tower stands 26 feet (8 m) high and 190 feet (58 m) above sea level. The light flashes on for 6 seconds and off for 6 seconds, and can be seen for 10 nautical miles (20 km). The props around the tower were added soon after it was built to stiffen it against the strong winds and gales that buffet this site. As half cents ceased being used for postage rates soon after its issue this stamp has quickly become the rarest in the set. 2½c - Puysegur Point Lighthouse. Puysegur Point is located on the southwestern tip of the South Island. It has gale force or higher winds for 100 days a year on average. It was named by a French navigator Dumont d'Urville in honour of an earlier navigator M. de Puységur. This is the second lighthouse on the site. The original wooden lighthouse was burnt down in 1943 by a man who had recently left a psychiatric hospital and made his way down to Coal Island across the fjord from the lighthouse. He decided the light was a deliberate plot to keep him awake at night by shining in his window so took matters into his own hands. He held all the keeper's hostage with a rifle, smashed the radiotelephone and set fire to the lighthouse. The ship pictured could only be the lighthouse tender as no other large ship would have cause to venture close onto this coast. The concrete lighthouse has now in turn been replaced by two automated beacons serviced by helicopter. 3c - Baring Head Lighthouse. 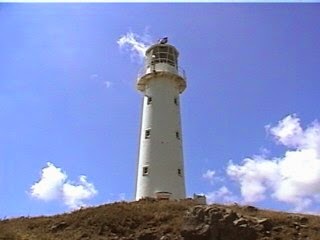 Baring Head Lighthouse is a concrete Lighthouse at Baring Head is outside the eastern entrance to Port Nicholson - Wellington Harbour - at the southern tip of the North Island. 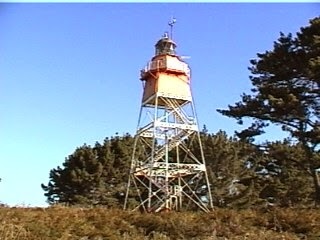 Its purpose was to be the main approach light to the Wellington Harbour as well as a coastal light for the Cook Strait. Lit on 18 June 1935, it replaced the light at Pencarrow Head which was decommissioned later that year. The lighthouse was initially powered by a diesel generator but was converted to mains electricity in 1950. The 1000 W light was fully automated in 1989. In 2005, the original lens was replaced by a flashing LED beacon visible from up to 18 kilometres (10 nmi). It is a site where New Zealand scientists have undertaken long-term monitoring of the Earth's atmosphere - a very unpolluted site remote from industry. Samples are taken during southerly winds direct from the Southern Oceans. Storms and gales that regularly hit this headland are what make this coast so notorious for shipping trying to enter Wellington Harbour. 4c - Cape Egmont Lighthouse. Cape Egmont is the westernmost point of Taranaki, on the west coast of New Zealand's North Island. It is located close to the volcanic cone of Mount Egmont or Mount Taranaki as its known today. It was named Kaap Pieter Boreel by Dutch explorer Abel Tasman in 1642 but renamed Cape Egmont by British explorer James Cook in 1769. Tasman did not sight Mount Taranaki, due to bad visibility, but Cook did, and after naming the mountain Mount Egmont, bestowed the same name on the promontory, which became the enduring name. Ironically, the cape retained a Dutch name, as Cook named the mountain and cape after the Earl of Egmont, who claimed descent of the Dutch House of Egmond. 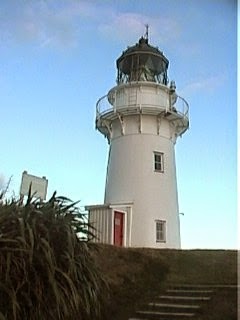 The Cape Egmont Lighthouse was manufactured by Simpson & Co., Pimlico, London, in 1864 and erected on Mana Island to the north-west of Porirua in 1865, but it was sometimes confused with the Pencarrow Head light at the entrance to Wellington Harbour and in 1877 the light was dismantled and moved to Cape Egmont. The light was fully automated in 1986. Variations in the strength of the yellow. These three stamps show the difference that can be made when one of the colours in a design varies. In this case, as more yellow has been added the colour of the foreground has changed, affecting the overall appearance of the stamps. You will also notice that there are variations in the blue sky as well. 15c - Dog Island Lighthouse. Dog Island is a low lying island in Foveaux Strait at the far south of the South Island. The strait is famous for oysters caught by a fishing fleet based at Bluff Harbour. Dog Island is low-lying and rocky, and its highest (natural) point is only 15 metres (49 ft) above sea level. The size of the island is 28 acres (0.11 km2). 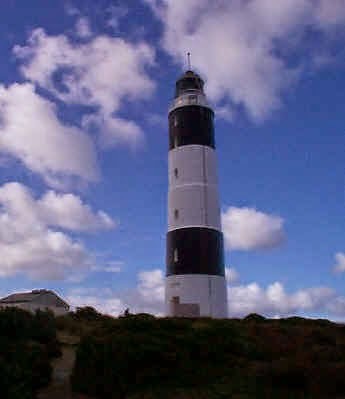 The lighthouse was designed by James Balfour, at the time marine engineer to the Otago Provincial Council and later to the Colonial Government of New Zealand, at a total height of 36 metres (118 ft); due to the low-lying nature of the island, the lighthouse had to be quite tall to be effective. It was built of stone quarried on the island. The lighthouse on Dog Island was first operated in August 1865. There were originally three lighthouse keepers with their families on the island. The initial rotating light mechanism had to be wound up hourly, and in 1883, the principal lighthouse keeper died when he fell down the central shaft trying to attach weights to the mechanism. Later, only one keeper lived on the island with his family. The lighthouse was automated in 1989, and the island has since been uninhabited. There is now an airstrip on the island making this an easy light to service. The Dog Island Lighthouse is the tallest lighthouse in New Zealand, and one of the oldest. Due to its black and white stripes, it might be considered one of New Zealand's most distinctive lighthouses. 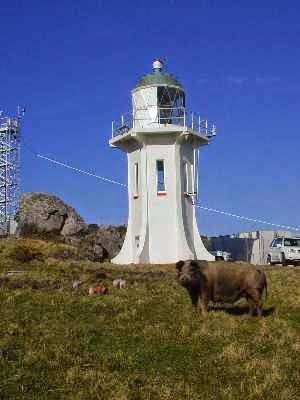 The lighthouse is registered by Heritage New Zealand as a Category I structure, with registration number 395. Colour shifts in the black. On the left-hand image, we have a vertical colour shift in the black on the left-hand stamp. The other stamp is a normal example for comparison. Both stamps on the right-hand image have a shift in the black to the right. First Day Cover - 27th March 1969. All five stamps from 1969 shown on a cover. Notice this special cover also celebrates the fact that this issue marks 100 years of service by the Life Insurance Office. 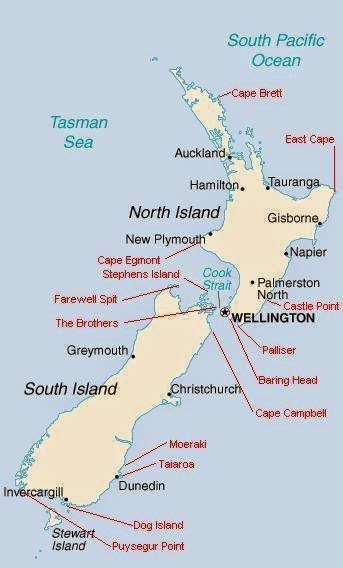 Below is a New Zealand map showing the locations of the various lighthouses shown on Government Life stamps. 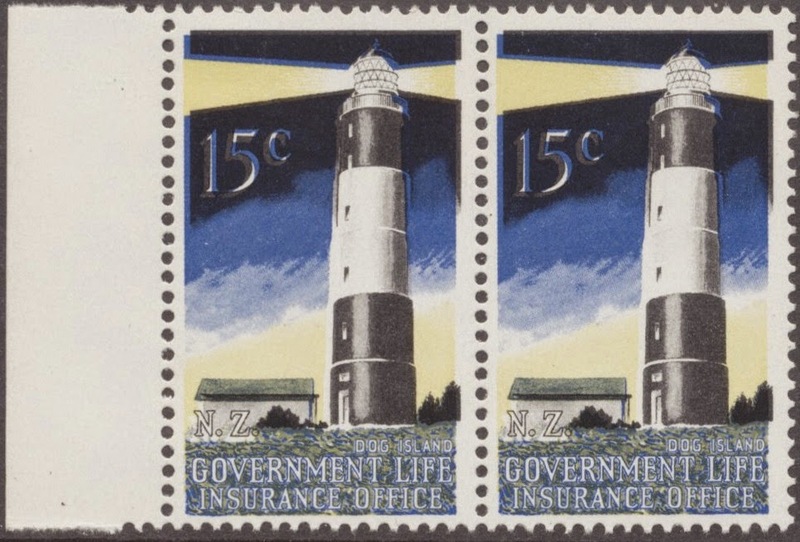 See if you can find each of the seven lighthouses of the stamps shown on this page. 8c - East Cape Lighthouse. 10c - Farewell Spit Lighthouse. East Cape Lighthouse. Farewell Spit Lighthouse. East Cape Lighthouse is a lighthouse sited on Otiki Hill above East Cape, the easternmost point on the North Island of New Zealand. It is owned and operated by Maritime New Zealand. The lighthouse was originally constructed on nearby East Island. However the island was difficult to access (four men died during tower construction when their boat capsized) and the site proved to be susceptible to earthquakes and subsequent landslips. It was becoming more and more likely that the lighthouse might fall into the sea, so something had to be done. 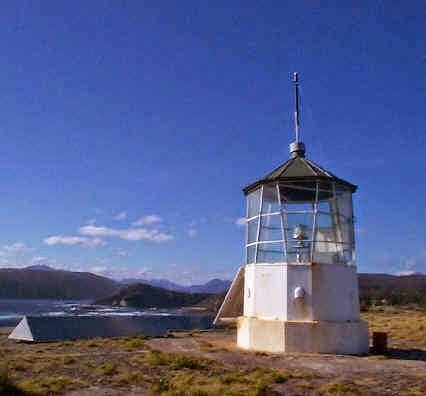 In 1920 a decision was made to relocate the light to the mainland and in April 1922, the light was extinguished and then relit at its current location in December of that year. Originally manned by three lighthouse keepers, the light's staffing was progressively reduced until it was fully automated in 1985. It is now controlled from the Maritime New Zealand headquarters in Wellington. While the area around the light is accessible by foot, the lighthouse itself is not open to the public. Farewell Spit is a narrow sand spit at the northern end of the Golden Bay. It runs eastwards from Cape Farewell, the South Island's northernmost point. It forms the northern side of Golden Bay and is the longest sand spit in New Zealand, stretching for about 26 km above sea level and another 6 km underwater. The spit is made from fine golden sand - as Cape Farewell to the west of the spit is mostly composed of late Cretaceous quartz sandstones. The northern side of the dunes are steeper and unstable being constantly exposed to the prevailing winds which average over 25 km/h. The southern side, that which faces Golden Bay is more stable and largely covered with vegetation. The tide here can recede as much as seven kilometres exposing some 80 square kilometres of mud flats; a rich feeding ground for the many seabirds in the area but also a trap for the frequently stranded whales. The original lighthouse was made of wood with the light at the end of the spit first being lit in 1870. The present steel-framed tower dates from 1897. A concrete tower was not considered due to the unstable nature of the spit. The last lighthouse keeper left in 1984 when it became fully automatic. First Day Cover - 17th November 1976. 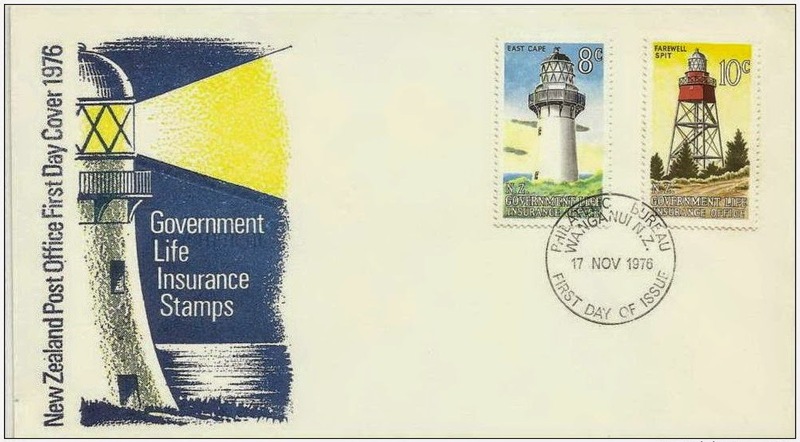 The 1976 cover shows a lighthouse on the left and the two cancelled stamps top right. In this particular example, the address is missing which shows this item has never travelled through the postal system. 25c (Overprint) - Puysegur Point Lighthouse. By 1978, the 2½c value was no longer required but there was a need for postage on larger envelopes containing contracts etc. The old value was overprinted with four diagonal lines and a new value of 25c was added. 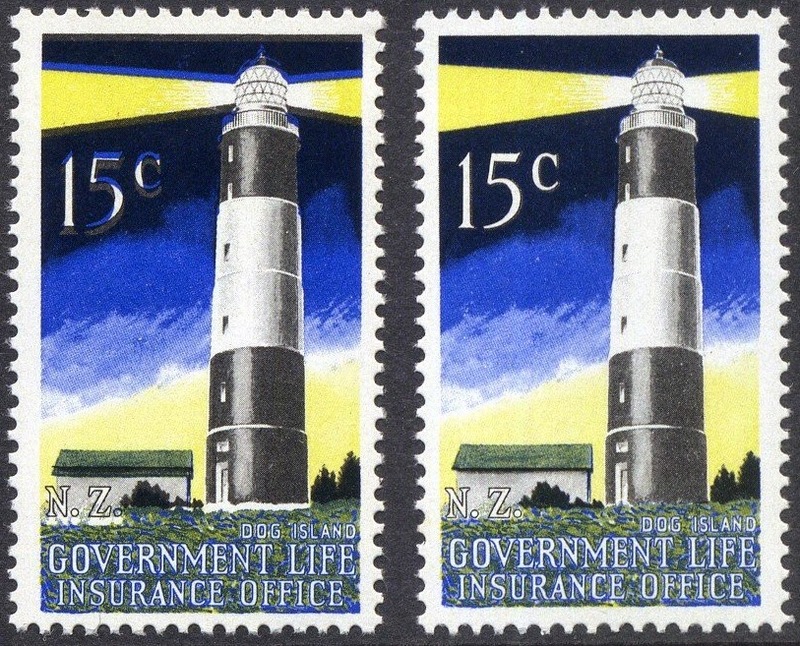 This would be the last issue in the Life Insurance series where an actual lighthouse was shown. First Day Cover - 8th March 1978. This First Day Cover of the 25c overprint shows an address and evidence that it has travelled through the postal system. I would much rather a cover like this than the 1976 one which, while being cancelled, shows no address. Comment from the USA concerning these stamps. We accidentally deleted it. Can you send again please. I'm hoping someone on the other end of this reads and responds, as I have some questions. First let me tell you how much I've enjoyed reading on this site. THANKS ! so much for the effort. I'm a US collector doing an exhibit on the Gov't Lighthouse stamps. It appears that in 1969 these stamps were authorized for use OUTSIDE of New Zealand. Do you have any reference or citation or documentation of this ? I know it is true, I'd just like to be able to cite the reference for my exhibit(s). Secondly, were these stamps (any of the life insurance stamps) ever authorized for personal/private party use outside of the life insurance department (later "office")? I ask because I have in my possession a 1977 cover and enclosed letter with 4 of the 8c East Cape stamps on the airmail envelope. I also have a cover mailed to me just this week from New Zealand which includes 5 of the 1969 Issues and one of the 1981 issues, but no other postage. I'd love to see documentation that says this use is legal or illegal, either way. Lastly, I'm looking to fill in my collection, particularly with a couple early covers but also with a few of the varieties. To that end I'm including my email address (oregonhart@charter.net) so that anyone reading this might send me suggestions of where I might find these. To date, Kadine Stamps has been my best, reasonably priced option while Mowbray's is too expensive for my budget. Sorry for Kim. She tried to release your first comment and it disappeared. I think accidentally deleted. Thanks for posting it again. If you are looking for additions to your collect I have two suggestions. 1)First is StampsNZ found at the bottom of each page of this blog. They have been very helpful by allowing us to use images from their website which is why we give a link back to their site. We are not stamp dealers and make nothing from sales that come through us. They have a very good range of stamps for a basic collection. 2) Try The Complete Stamp Company. http://www.completestamp.co.nz/ This website has some amazing items waiting for someone to find. 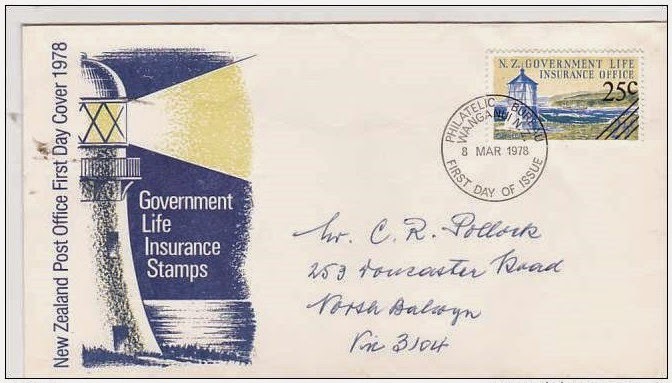 Currently they have over 500 items related to Life Insurance Stamps. Now it is my understanding that these stamps were created due to a disagreement between two Government Departments. The idea is that use of the stamp will show postage has been made. Much in the same way personalized stamps work today. When real lighthouses began to appear on these stamps there was considerable interest generated and the office did make stamps on First Day Covers available to the public. After that the stamps were available for collectors but not for postal use. If anyone can through more light on this, both John and I would be interested in talking with you. If you wish a comment not to be published place the words "Non Publish" at the top. Well read it but not publish.